There are so many reasons to love gallery walls that it's hard to choose just one. From an art lover's perspective, there's just something irresistible about showcasing so much of your collection in one group, The end result will say a lot about you—and to you. For the room designer, a gallery wall can be the answer to many of the challenges a room a might pose. Requiring less work than wallpaper and less cleanup than painting, gallery walls are an ideal way to bring in whatever your room might need, whether it's color, pattern, or personality. And of course, once you start to get the hang of this multifaceted technique, the opportunities are close to endless. This gallery wall tells a color story in shades of blue and gray, beginning with the sofa and floor pillow and building upward. Gallery walls offer an exceptional way to use color to bring life to a space in a way that requires little else. But even when most of the color in your room is on a gallery wall, it's important to have furniture, accessories, or other pieces that tie the colors of the wall to the rest of the room. Otherwise, you run the risk of having your wall feel visually isolated from the rest of the space leaving the room looking disjointed. The sheer number of colors present when a gallery collection is hung on a painted wall makes for an instant attention grabber. When assembling your images, be sure to take your wall color as a base and choose the color of your art accordingly. In this room, much of the art on the wall includes white space that both creates gaps and establishes complementary shades. But the star of the show is unquestionably the light pink, which not only pops off of the wall but also echoes other shades in the room to create a cohesive look. When you've got strong color stories running through both your walls and your furniture, your gallery wall can play an important role in drawing your room together. The pieces in this gallery wall provide subtle moments of pink and green to tie the walls and furnishings together but also add in pops of blue, red, and white. For art lovers whose collections are too large to contain on just one wall, why not use two? In this room, the connected gallery walls work as a form of wallpaper, covering the space in colorful imagery. Against the backdrop of white walls and black floors, this gallery wall is an inspired way to create a room full of color, pattern, and energy. Even though they're often referred to as "art walls," one of the most important things to remember when constructing a gallery wall is that they can contain more than just framed works of art. Other interesting wall-mounted pieces, such as antlers or even lamps, can play a role in your gallery wall. Such an eclectic selection creates three-dimensional interest that is sure to draw all eyes. It's one of the biggest questions that all designers eventually have to face—what are we supposed to do with the television? If that's an issue that has ever perplexed you as a home designer, consider giving this option a try. In the age of wall-mounted televisions, there's absolutely no reason why your TV can't double as wall art. Size matters when it comes to gallery walls—or more specifically, sizes matter. Whether you're working with just a few pieces or filling an entire wall, one of the most important things you can do is to vary the sizes of the artworks. When looking at this space, consider how boring this wall-filling gallery would be if all of the frames were the same size. 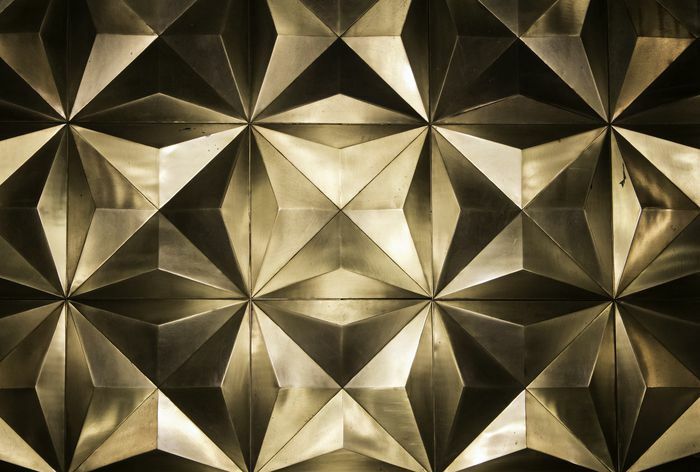 Pattern is one of the indispensable, fundamental building blocks of decor, and your walls are one of the biggest opportunities you have to squeeze in a little more. Just as with color, contrast is a useful tool when choosing patterns for your space. In this living room, the patterns on the sofa and rug are subtly but meaningfully contrasted by the abstract line patterns in the art. This gallery wall does an amazing job of combining eclectic pieces in various sizes and colors to bring loads of visual interest to this somewhat plain, traditional bedroom. In a colorful space, a colorful gallery wall is a must. But on this wall, the color goes beyond the artwork. Take a closer look at the frames surrounding the art and you'll find yet another splash of exciting color. 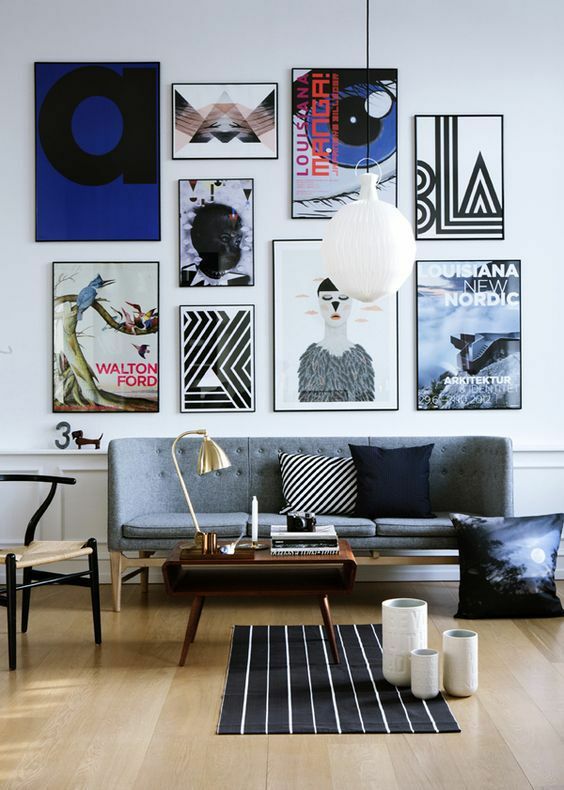 Modern, eclectic gallery walls aren't only for modern, eclectic spaces. Under the right circumstances, a gallery wall can help complete the perfect rustic look as well. A gallery wall isn't just a great way to add color—sometimes it's the best way to break up large blocks of a bold color. The beautiful blue wall that dominates this space might be too overwhelming if not for the equally colorful gallery wall that both complements and tames the bold wall. Art on the walls serves as a decor accessory just as much as do pillows on the couch. And since these two elements are often responsible for carrying most of the color in a room, it's important to keep the two in conversation. In this room, the mostly neutral gallery wall tones down the colors of the couch and pillows, but still connects to them with small pops of color. While the larger, more colorful gallery walls are certainly dramatic, there are more than a few advantages to a minimalist approach. This gallery wall combines frames of different sizes with a mostly neutral color palette for a beautifully understated wall feature. On the other hand, you can always go bigger. An opulent, over-the-top room may well call for a gallery wall that meets it on equal footing. The great thing about gallery walls is that they can extend as far as your imagination. In this case, a colorful gallery wall begins near the floor and soars all the up to the ceiling. A neutral wall texture is a perfect backdrop to many art pieces. Gallery walls aren't just for living rooms and bedrooms. Take your art to an unexpected place and create a gallery wall somewhere new. In this space, the stairwell is where it all happens. For a mesmerizing wall display, pair bright colors with strong patterns. Here's another great example of colors that start on the couch and extend upwards via a gallery wall. When using this method in a space with neutral walls, look for pieces that have a lot of negative space. This will allow the gallery wall to echo both the vibrant color story of the furnishings, as well as the neutral story of the wall—all at the same time. Nature favors asymmetry, and your gallery walls should, too. When creating your gallery wall, start with a large cluster of works on one end and become more sparse as you go. Or, start low and trail off your collection as you go upwards. This creates a sense of movement that makes your gallery wall the most interesting part of the room. Variety isn't just the spice of life—it's also a key ingredient in creating gallery walls. Varying the style of your frames is as important as varying the sizes of the pieces you use. On this wall, many of the frames are picking up different colors from the rug, while others are black. Some pieces aren't framed at all. From the ceiling to the floor and back. Connecting your gallery wall to standing pieces placed on the floor is a great way to showcase a home that is all about art—as well as the character of the homeowner. When placing a gallery against a dark wall, white frames can pop out just as much as the brightest-colored artwork. And while you're at it, throw in one black frame for a bit of style. A gallery wall is a wonderful way to not only showcase your taste in art but to pick up on themes in the room as well. Here, leaf-inspired art picks up and amplifies the love of houseplants that is clearly the theme of this room. Though a big gallery wall might seem flashy and dramatic, as is true so many other parts of design, it is the subtle touches that make it work in a room. Here, two small, geometric pieces closely reflect the pattern of the rug while elsewhere on the wall, another piece incorporates the subtle hints of pink found in the room.